Data suggests this is an unachievable target. So, why is the NPCI, an independent body, being compelled to match government ambition? The government of Prime Minister Narendra Modi has made two big bets on digital payments. Some weeks after demonetisation, government representatives began to extol the virtues of digital payments as a means to increasing economic transparency, formalizing the economy, and widening the tax base. As outcomes have shown, this was a sober recalibration of the objectives of demonetization. And earlier this year, the government announced the “DigiDhan Mission" to achieve a 25 billion digital transactions target, outlined in the Union budget for this fiscal. This programme aims to establish a robust digital payments ecosystem in a potentially transformative attempt to drain the swamp of illicit monetary transactions. As we approach the completion of the second quarter of this fiscal, it is important to take stock of achievements against this target. The National Payments Corporation of India (NPCI), an umbrella organization which anchors digital retail payments in the country, has aligned itself with the government target. It has estimated that it will contribute around 11 billion transactions to the government target of 25 billion, through its own bouquet of products and services. By implication, it expects the other 14 billion transactions to come from the Reserve Bank of India’s payments systems as well as private card networks. There are three curious data points which relate to NPCI’s target, that are worth investigating. First, the NPCI runs the Immediate Payments System (IMPS)—a 24x7 electronic fund transfer service, on which a significant share of interbank transactions are made digitally. In the last fiscal, the IMPS logged just over 500 million transactions. The NPCI estimates that IMPS-based transactions will cross the one billion mark this fiscal, growing at around 100%. With IMPS transactions stabilizing at a monthly rate of 6.5 million in the first quarter, this target will not be met. 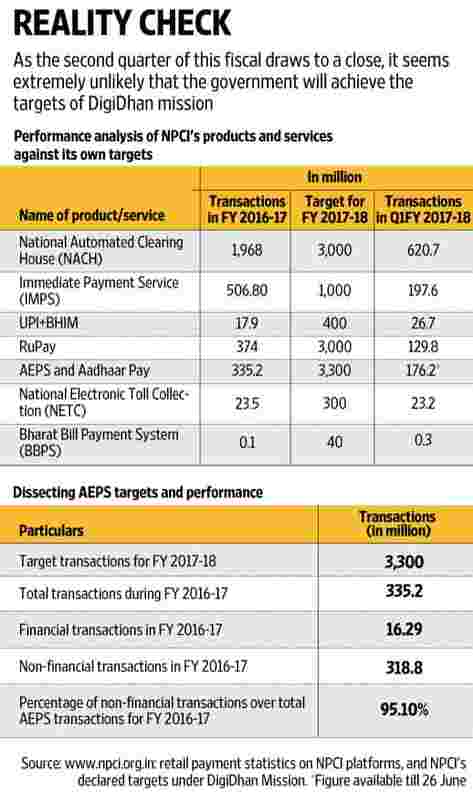 Second, NPCI also runs the Aadhaar Enabled Payment System (AEPS), of which the much touted Bharat Interface for Money (BHIM) application is a part; and it has projected 1000% annual growth to achieve 3.3 billion AEPS transactions this fiscal. However, over 95% of AEPS transactions in the last fiscal related to authentication services—that is, authentications by the Unique Identification Authority of India over micro ATMs. The NPCI should be circumspect about including non-financial transactions in its 11 billion target. At the very least, a clear caveat is warranted. Third, NPCI aims for over 650% growth in RuPay-based transactions to account for around three billion transactions in this fiscal. If first quarter statistics are any indication, the NPCI will achieve less than a fourth of its annual target for RuPay. The central question therefore is: Why is the NPCI, a non-government body, compelled to set unachievable targets to match unfettered government ambition? One can only hope that this is not a bait and switch measure, especially as accountability may not come easily to the NPCI. The Committee for Digital Payments set up by the ministry of finance under the chairmanship of Ratan Watal, is unequivocal about the fact that “the present ownership structure of NPCI might be conflicted with its pivotal role in the digital payments ecosystem", in its December 2016 report. And now there are clear indications of this conflict playing out. The NPCI-owned BHIM application, which facilitates fund transfers using mobile phones, is availing of Rs4.5 billion allocated this fiscal by the government for its aggressive promotion through cash-back and referral bonus incentives. Through a fresh notification on 14 August, the government has further extended these schemes till 31 March next year. Subsidization of NPCI’s gimmicky marketing, to achieve a government target, is reminiscent of the way public sector utilities function. Why are Indian taxpayers investing in the growth of NPCI’s products and services? The crux of the matter is that the NPCI has shunned an ecosystem approach by disallowing non-bank payment service providers (PSPs) from using its network and interface. For banks, PSPs are a necessary evil. Necessary because consumers now demand the ability to make digital transactions through disparate means. And evil because digitization reduces dependence on traditional banking services, and increases the velocity of transactions—whereas banks would want their deposits to be as inert as possible (to maximize interest earned on the “float"). Consequently, even though many NPCI owners are private businesses, which are themselves products of fair and open competition, they will not complain about receiving preferential treatment from government. It is the government’s job to recognize that creating markets without economic incentives or depth is meaningless. In fact, NPCI, by being the only company which owns and runs retail payments infrastructure as well as its own products and services, and by setting standards that determine who can and cannot participate on its captive turf, is beginning to look like a combination of a regulator and a natural monopoly. It has done little to dispel such notions, even if they seem exaggerated from within. Frankly, swadeshi start-ups find it as difficult to prosper in this market as foreign incumbents. And while many remain bullish about India, the country’s narrative cannot forever remain confined to that of immense potential. With slowing growth of gross domestic product, an inflection point is upon us. The government must show that all of its economic and programmatic targets are serious. In this case, it can begin by holding the NPCI to account and by embracing suggestions from its own committee. These include the diversification of NPCI’s ownership, and a road map for setting up new companies that can own and operate critical payments infrastructure like the NPCI does. Vivan Sharan is a partner at Koan Advisory Group, Delhi.